Summary of today’s show: Scot and Fr. Chris welcome Deacon Eric Bennett to talk about his recent ordination to the transitional diaconate, his experiences as a seminarian at the Pontifical North American College in Rome, being one of two siblings among his eight to be studying for the priesthood, and the five places in Rome every visitor should see. 1st segment: Scot asked Fr. Chris how St. John Seminary fared in Hurricane Irene. It did well and it was their first day welcoming back seminarians and the new men. All of them did show up. No one had cold feet at the last minute. He told them as he welcomed them that there are two major days for the seminary: welcoming new men and the ordinations. Scot asked what the first week is like at the seminary. On Sunday afternoon, Bishop Kennedy celebrated a Mass of welcome and then there was a dinner. They explained how they do what they do and they follow Pope John Paul’s Pastores dabo vobis (“I will give you shepherds”), which is a program for seminary formation. The first week does have a spiritual component, but they include recreation and prayer and Scot will come to give some presentations on virtues that any Catholic man should have. Priestly virtue builds on human virtue. What are the virtues and vices that are presented to Catholic men and how can seminarians grow in human virtue? Simplicity of life, getting priorities in order, building strong relationships with people. Fr. Chris said Pope John Paul II said the intellectual and pastoral must be formed on the human virtues. Priests have to be aware of the rough edges that get in the way of proclaiming Christ. He’s also thrilled to have Scot at the seminary to see excited, intelligent, articulate young men getting ready to go out into the vineyards to proclaim the Gospel. Scot said seminarians of Boston study at St. John Seminary, Blessed John XXIII Seminary in Weston, MA, and the Pontifical North American College in Rome. Both Fr. Chris and Scot have spent one year at the NAC. Deacon Eric is studying there now. Fr. Chris said there are joys to serving in Rome. 2nd segment: Scot and Fr. Chris welcome Deacon Eric Bennet, ordained one month ago to the diaconate. He was ordained on July 16 at St. Patrick, Natick. That was his parish before entering the seminary. He was living there when he was working as a physical therapist when he applied for the seminary. Scot said it’s been a long time since an ordination took place outside the Cathedral of the Holy Cross, but with just one man being ordained a smaller church was good even though it was filled with friends and family. He went to high school in Rhode Island and attended Boston University. At BU, he got a sense of knowing Jesus Christ through the ministry of the Brotherhood of Hope at the university. After graduation, he moved to Maryland and thought he was called to marriage, but once in Maryland he found the call back to Boston and to the priesthood. It was through his work as a physical therapist, mainly in the cancer ward of Johns Hopkins Hospital. He saw it as a grace and blessing to be with the people and helping them physically and spiritually as they wished. People kept asking him if he ever thought of being a priest and over time he came to see that he was being called to that. For Bennett’s mother, Kathleen, seeing her son lying prostrate reminded her of when he was two years old and would lie on the floor in fits of anger. “Well he used to get upset and lie on the floor and I’m thinking ‘Look at him at now’ it’s just like, a miracle,” said Kathleen. Many of Eric’s classmates will be ordained together in Rome, but Eric chose to be ordained here in the summer so his friends and family could attend, including friends from other states and even from Ireland. He was able to share Boston as his home with them. Eric has a brother entering seminary in Providence this fall. Fr. Chris asked if they are a religious family. His mother raised them in the faith although his father had been Baptist. He eventually converted to Catholicism. Ever since he’s entered seminary his family has become very zealous and on fire for the faith. Fr. Chris said at Eric’s ordination, his two young nephews brought up the gifts to the cardinal and gave a very solemn bow in a very moving moment. Scot asked what it’s like for his brother to enter seminary. For Eric, it’s a sense of newness and a sense of hope to see another man answering the call of God to the priesthood. A pivotal person in his discernment was Fr. Paul Helfrich of the Brotherhood of Hope at BU. Scot asked what was it about him? Eric said it was the way he gave his entire life over to showing Jesus Christ to every student, being there every morning until late at night. He made many sacrifices for people to know Jesus Christ. He also showed a lot of patience. He may have seen Eric’s vocation, but didn’t force it. Eric saw him as a spiritual father. Scot said many young Catholics from BU are very inspiring in their faith. It’s not a Catholic university, but there are many Catholics within the larger community. Eric said the students see that their community is because of Jesus Christ. Seeing the truth lived out in a loving manner, it’s very attractive and that’s the way the Brotherhood of Hope has done ministry. 3rd segment: Eric will be going back to Rome for two more years in preparation for ordination. He will be studying for a Licentiate in Ministry. Scot asked him what his reaction was to finding out he would be studying in Rome. He said he never expected it. There was a sense of it being a mistake. He was excited and a little hesitant. When the Cardinal asked him formally, he was able to embrace the idea. He feels a great sense of responsibility but also a sense of joy to experience a world he’s never encountered before. Many of the states in the US are represented, with 250 men studying there, including some Australians and Canadians. One of the blessings in being Rome is seeing the Church in different countries throughout Europe, to see how universal the Church is, but also how different. Fr. Chris said he’s had an apostolate in Rome. Eric said every seminarian has an apostolate and his was to go to St. Peter’s Square and evangelize people visiting the church, to help them make a pilgrimage, not just a tourist visit. His group of seminarians would answer questions and bring them to a spiritual level. On St. Joseph’s Day of his first year at seminary, he met a young couple from Oklahoma who were asking questions and had misconceptions about the Church. By the end of their conversation, they were floored by the faith they encountered in room. He’s met Pope Benedict last January when the seminary was celebrating its 150th anniversary. He was surprised to see how small in stature he was, but he was also surprised by how he shook the hand of every person in the hall. He goes to the Sunday Angelus messages a couple of times per month, but he doesn’t get to go to the Wednesday audiences because he’s in classes. Fr. Chris noticed all his classes are in Italian. He asked what the most interesting class was. He said it was his moral theology class on bioethics and sexual morality last summer. But he would also say his class on the doctrine of grace, how the Church fathers saw it, and how it’s centrality to our understanding of Christ. Fr. Chris asked him to define grace: It’s the overflowing of God in our lives and his divine assistance to bring us to be fully human and to one day be with him in eternal life. NAC seminarians can study at either the Gregorian University or the Angelicum (where classes are in English) or Santa Croce. The cardinal had asked him to go to the Gregorian so he could learn Italian which would benefit him. Fr. Chris said the NAC is where the men reside and receive some formation, but they study at universities where they are side by side with men and women from all over the world. Eric said the stereotypes of cultures are often true and to see the cultures of religious and laity as well as from different nations. He said the US is very blessed to have priests and bishops who are very knowledgeable and with great understanding. Seeing places in Rome where the saints have been and praying at their tombs is a great blessing to studying there. Going throughout different parts of Europe to see the ancient Church there as well. He also loves the fraternity of the NAC, especially with guys from all over the country. Scot asked him how he stays in touch with his family. Older priests tell him that most communication was mail or a phone call every few months. But now all the guys have their own cell phones, email, and Skype to have videoconferences with family. In his studies, he has the equivalent of a bachelor’s, an STB. Now he’s studying for the STL, Licentiate of sacred theology, which is about halfway between a Master’s and a doctorate. The topic is moral theology, which was a choice made by Cardinal Sean from Eric’s own list of preferences. Fr. Chris asked Eric where in Rome he loves to go to pray. San Luigi dei Francesi has a beautiful Caravaggio painting of the Call of St. Matthew and where he loves to pray. His favorite tradition is on Holy Thursday to go to all the churches where people pray before the Blessed Sacrament in repose using all their local customs. The hardest part of being in Rome is being away from the Archdiocese, especially priests and friends here, as well as being away from family and all the family occasions. He looks forward to coming back full-time after he’s ordained. 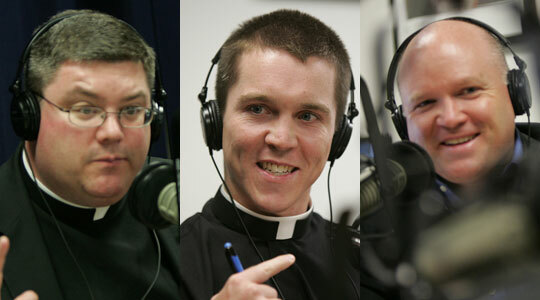 The other men from Boston include Tom McDonald, a third-year seminarian; Msgr. Connie McCrae; Msgr. Bob Deeley has just come back from Rome to be vicar general; Fr. Richard Erikson, outgoing vicar general will be going to Rome. A few other priests will be going for three-month sabbaticals for the fall and spring. Msgr. Paul McInerney is at St. Mary Major. 4th segment: This summer Eric was at St. Rose of Lima in Chelsea for pastoral ministry. It’s not usual for seminarians at the NAC to be able to go to work in a parish in the summer. He’s done a lot of work in the parish, following the pastor, and learning about ministering to Hispanic immigrants and newcomers. He’s also seeing the challenge of bringing together three communities of Spanish, Vietnamese, and English. Fr. Chris asked Eric what his one homily he is preaching is about: Jesus Christ wants us to be saints and the call to holiness that Pope John Paul was so energetic about preaching. He has not yet preached in Spanish, but he will do so this weekend, his last weekend. The people of St. Rose show how much they love seminarians and recognize his limitations, but are willing to show him his strengths and how he has helped them. Scot asked him what he plans to do in his ministry as deacon in Rome. Eric said every deacon gets to preach at least once during the year on a weekday Mass. Outside of that they assist at the altar, do Holy Hours once or twice a month. They also have an apostolate. His is at St. John’s University in New York’s Rome campus. He will be doing campus ministry with the students, Holy Hours, and preaching on Sundays. Fr. Chris asked him what from the Brotherhood of Hope he has learned for campus ministry. Eric said the key trick is offering food. He also notes that the students are only there for a short period of time, so giving them a spiritual perspective on Rome, rather than a touristy. His favorite church in Rome is San Clemente. It is one of the oldest churches in Rome, built on the ruins of churches dating back to the first century. Cardinal O’Connell was the priest of San Clemente. Fr. Chris explained that Cardinals become priests of the churches of Rome to become part of the clergy of Rome so that the Bishop of Rome is elected by the clergy of Rome. Fr. Chris’ favorite church in Rome is Santa Maria Trastevere. It is one of the oldest churches dedicated to Mary. The mosaics are especially beautiful. Scot’s favorite church is St. Peter’s at 7am, where it is really a house of prayer. There aren’t tourists there at the time. He also loves St. John Lateran, especially the statues of all the apostles. St. Peter’s can be overwhelming, but St. John is not. What Eric will bring back from Chelsea to the rest of his formation is encountering the poor and the broken, to help them and speak with them, to show that God loves them and get them the human help they need. He encounters the poor in Rome every day, but it’s a different experience in the US. His ordination date is set for June 23, 2012 along with five others. For those thinking of priesthood, go on a discernment retreat in February at St. John’s Seminary. Also continually to pray before the Blessed Sacrament and trust that God will call you and he find you.